1) Preheat oven to 350°. Season short ribs with salt and pepper. 2) Heat oil in a large Dutch oven over medium-high heat. In batches, brown short ribs on all sides, this will take about 8 minutes per batch. 3)Transfer short ribs to a plate. Pour off all but 3 Tbsp. drippings from pot. 4) Add onions, carrots, peppers, and celery to pot and cook over medium-high heat, stirring often, until onions are browned, about 5 minutes. 5) Add flour and tomato paste, stir constantly until flour and tomato paste are well combined and deep red, 2-3 minutes. 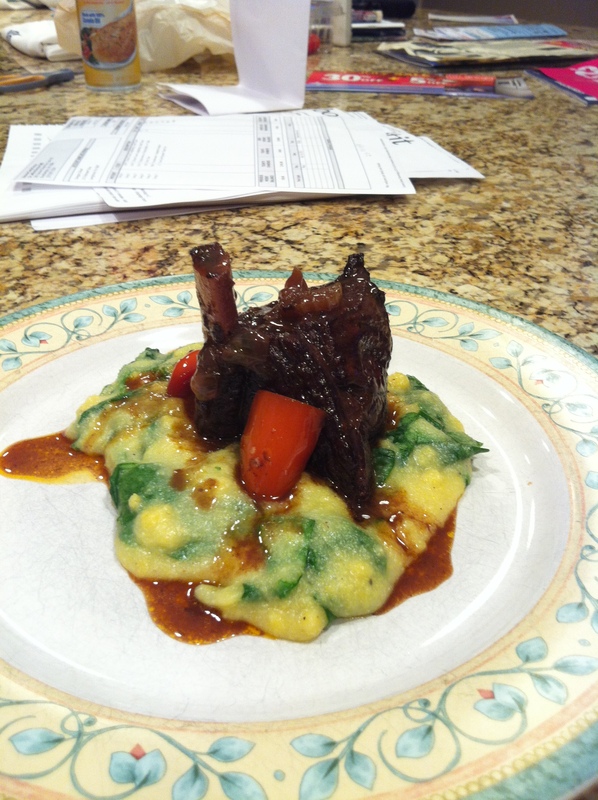 6) Pour in wine, add short ribs with any accumulated juices. Bring to a boil then lower heat to medium and simmer until wine is reduced by half, about 25-30 minutes. 7) Put herbs in cheese cloth and wrap. Add herb bundle to pot along with garlic. Stir in stock. Bring to a boil, cover, and transfer to oven. 8) Cook in oven until short ribs are tender, ~2 1/2 hours. Transfer short ribs to a platter. 9) Strain sauce from pot into a measuring cup. Spoon fat from surface of sauce and discard. 10) Place sauce in sauce pan and bring to boil. Season sauce to taste with salt and pepper. Cook for ~5 minutes. 11) Serve in shallow bowls over mashed potatoes with sauce and vegetables spooned over.